The OCI President is under increasing pressure. Hickey has been head of the Olympic Council of Ireland for 28 years. 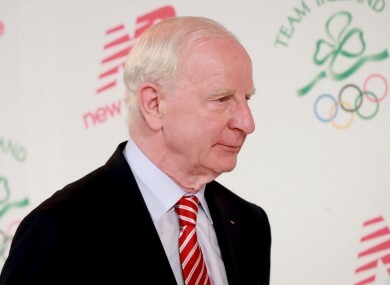 PRESIDENT OF THE Olympic Council of Ireland Pat Hickey has said there was no impropriety whatsoever from anyone in the OCI in the dealing of tickets for the Olympic Games. An Irishman is due to face charges in the coming days for allegedly touting Olympic Games tickets at exorbitant prices in Rio de Janeiro. Kevin James Mallon was arrested at a Rio hotel as he allegedly sold tickets to around 20 buyers last Friday, the day of the opening ceremony. Brazilian Police seized 781 tickets being sold at “extremely high prices” of up to €7,200. The tickets that were allegedly being sold were registered to the Olympic Council of Ireland (OCI) which has confirmed that it is carrying out its own inquiries. “We have formally requested the Rio 2016 Organising Committee to pass on immediately all evidence and relevant information from the investigating Brazilian authorities to enable the OCI to advance our inquiries as quickly as possible,” the council said in a statement today. The OCI also recommended to the International Olympic Committee that if any wrongdoing is found on the part of any authorised ticket reseller than their status as a reseller should be reviewed. There have also been calls for Hickey to appear before the Public Accounts Committee to answer questions on the affair. Speaking this afternoon on RTÉ’s News at One, PAC chairman Seán Fleming said that he has questions to answer. “Pat Hickey needs to come before an Oireachtas Committee as soon as possible. That will be after the Olympics but in the meantime he needs to make a complete and frank statement now,” Fleming said. He must have a good idea of where the breakdown in the system in relation to the ticket allocation sales and resale occurred, so I think he could give a bit of clarification on that at this stage because Ireland is getting bad publicity internationally and we can do without that at this stage. Fleming went on to say that the OCI’s statement that ticket resellers should be punished is “a joke”. “There has to be stronger sanctions than that,” he said. Fleming says that there is “no doubt” that the Oireachtas Committee on Transport, Tourism and Sport will want to speak to Hickey. The Fianna Fáil TD added that he doesn’t feel PAC is the appropriate committee for Hickey to appear because the vast majority of the OCI’s income comes from outside sources. Hickey is stepping down from his role as OCI President at the end of the Rio games. He has held the position for 28 years. The Irish national arrested over the allegations was described as a director at British firm THG, which already faced similar accusations during the 2014 World Cup. Email “Irish Olympic ticket scandal: Pat Hickey says there was 'no impropriety whatsoever' from OCI”. Feedback on “Irish Olympic ticket scandal: Pat Hickey says there was 'no impropriety whatsoever' from OCI”.